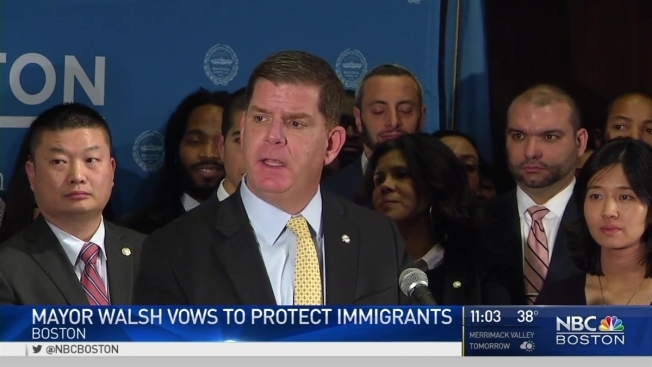 Boston Mayor Marty Walsh spoke out emphatically against President Trump's executive orders on immigration at a press conference Wednesday afternoon. Standing in front of rows of immigrant city workers and officials, the mayor said he was disturbed by the president's moves. "I want everyone to just get a good picture of behind me today. This is America, who's behind me," the mayor said. "Many immigrants who work for the City of Boston, and many first-generation Americans who work for the City of Boston, who are proud of their heritage and where they come from." Trump's White House is "advancing the most destructive and un-American threats made to America during the campaign," Walsh proclaimed. Mayor Marty Walsh talks about President Trump's plans to block federal grants from sanctuary cities. The executive actions Trump signed block federal funding for sanctuary cities that protect immigrants, as well as jumpstarting construction of a wall on the Mexican border. "I want to say directly to anyone who feels threatened today, or vulnerable: You are safe in Boston," Walsh said. "We will do everything lawful in our power to protect you. If necessary, we will use City Hall itself to shelter and protect anyone who's targeted unjustly." 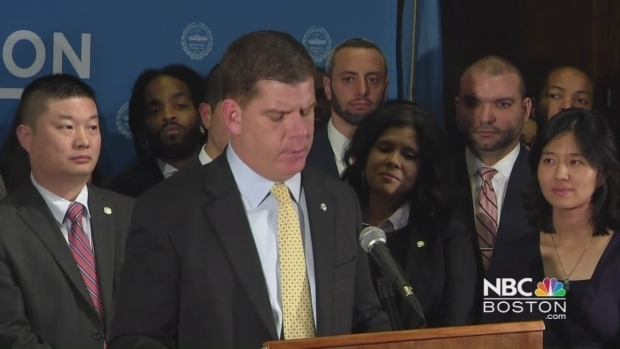 A lack of funding from Washington, the mayor said, will not deter Boston from protecting its residents. "We will not be intimidated by the threat to federal funding. We have each other's backs, and we have the Constitution of the United States of America on our side," Walsh said. "A president's job is to bring us together and elevate us, not to divide each of us and tear us down." Walsh promised to let immigrants who feel threatened by Trump's actions take shelter in City Hall if necessary. "That means if people want to live here they can live here. They can use my office, they can use any office in this building," Walsh said. Threats to funding for Mass. 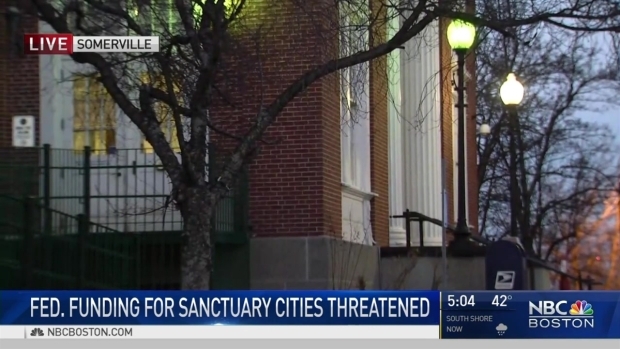 sanctuary cities surface after new executive orders. Massachusetts Attorney General Maura Healey reacted saying the president's actions were irresponsible. "Strong, independently-governed communities are part of what makes Massachusetts great. The President’s executive order is an irresponsible attempt to coerce our communities into conducting his mass deportations, and would impact all residents by stripping federal funding for roads, schools, police, health care, the elderly, and assistance for those in need. My office will be watching closely and I will be ready to stand with our cities and towns in the coming days," Healey said in a statement. The ACLU of Massachusetts issued a statement supporting Walsh's hard stance. "The ACLU stands shoulder-to-shoulder with Mayor Walsh and other public officials who are willing to stand up to the Trump administration's unpatriotic, wrongheaded, and unconstitutional executive order," Executive Director Carol Rose said in a statement. "We stand with those who seek to unify the country behind protecting fundamental rights and liberties. And to the Trump administration officials who seek to do otherwise: we'll see you in court."